Well, it took me longer than planned, but to balance, I will have two posts to make this week! So, the flowers from the last post….. It was just too much….faffing. The knit itself was okay, but then having to slip stitch the top to form the pointy shape, then you had to stitch it in place once again after shaping? Way too faffy. The second design I kind of gave up on..
That’s the first part, and you knit a second smaller one which sits on top, with an embellishment in the middle. But again with the slip stitch and seaming. Maybe it doesn’t exist. 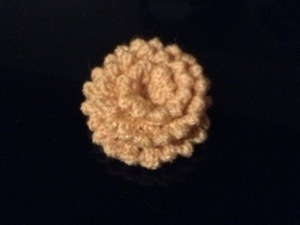 Maybe I’m looking for something that can only be done in crochet, which despite many attempts, I have never managed to grasp. But if anyone out there has a pattern for a pretty flower that doesn’t involve more sewing than it does knitting, well I’d love to hear it! 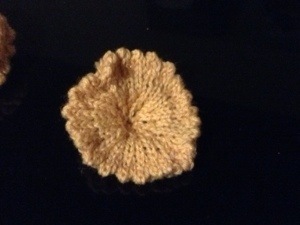 This entry was posted in knitting and tagged flower.